Dear child, it’s time to say goodnight. I’ll watch beside you while you sleep’. As you can see Stormy Weather is written in beautiful lilting rhyme and there is a serene and tranquil quality in the words chosen and the pace and rhythm. It has a very reassuring tone which I am sure will appeal to most small children. This is a lovely ending to the story and an ideal moment to kiss your child goodnight and turn out the light as they curl up in their own warm beds! This is such a great verbal image which is reinforced visually through the powerful illustrations. All the illustrations are very vivid and bold, and definitely worth spending some time over. I also like the fact that the story is written in rhyme. As well as providing a gentle lilt, it gives young children the opportunity to develop some phonological awareness skills especially if they have a go at providing the rhyming words. Overall this is a fabulous book that I feel convinced that most small children will love and will want read over and over again. 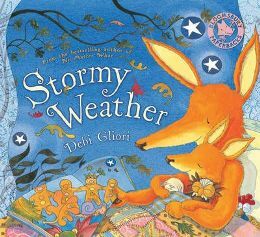 The thoughtful language, the beautiful illustrations and the warm sentiments behind the story make this an absolute winner! No Comments on "Stormy Weather"